Sri Lanka’s Anusha Dilrukshi Koddithuwakku had to settle for the bronze medal after losing to India’s M C Mary Kom in the semi-finals of the women’s 48 kg boxing event in the 2018 Commonwealth Games in Gold Coast on Wednesday. Mary Kom, also a sitting MP in India, prevailed 5-0 in a contest where clean punches were few and far. Despite the height advantage Koddithuwakku struggled to connect for most part. The five-time world champion and Olympic bronze-medallist Indian is competing in her maiden CWG and assured herself of at least a silver medal..
Sri Lanka has achieved its best performance in Commonwealth Games history with three medals in the ring taking the total for Team Lanka to a record six. 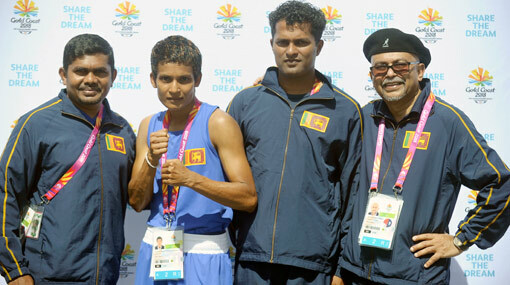 Koddituwakku becomes the first woman to win a boxing medal for Sri Lanka at the Commonwealth Games. Anusha had to settle for the bronze medal in the women’s 45-48kg class after the 35-year-old favourite Kom won a unanimous points decision with all five judges giving the Indian all three rounds. The bronze medal, however, is a huge achievement for Anusha who had returned to the ring from a lengthy break due to injury. She is the first female boxer to win a Commonwealth Games medal for Sri Lanka. “This is a very proud moment for me. All the hard work I have put in over the last few months have paid off and I’m happy to be the first female boxer to win a medal at these Games for Sri Lanka,” Anusha said. Sri Lanka is assured of another two medals in the ring with Thiwanka Ranasinghe and Ishan Bandara reaching the semi-finals of their respective classes. Ranasinghe defeated Vanuatu’s Berry Namri on points in the men’s light flyweight 46-49kg class while Bandara also won on points, beating Lesotho’s Thabo Molefe in the 52kg class. On Friday, Ranasinghe and Bandara,who are now both certain of bronze medals, will be up against fancied Englishman Galal Yafai and India’s Gaurav Solanki respectively. If they get past these hurdles, Sri Lanka is in store for a fantastic Friday. Ranasinghe and Bandara are the first local male boxers to win a Commonwealth Games medal since 1950.